In the 1990s the word hydroponics elicited images of space-age gardening, some exotic technique requiring all sorts of gadgetry and instrumentation. The passengers of Star Trek Voyager relied on hydroponics as a way of sustaining themselves despite limited energy resources. Bringing hydroponics out of the realm of sci-fi and into the real world, Walt Disney World has featured its breathtaking hydroponics operation in the Epcot theme park. Young and old alike can see firsthand how clean and efficient hydroponic gardening can be. But are hydroponics just for large-scale commercial operations? Is it reserved for NASA and trained horticulturists? What about unlettered home gardeners? Is there such a thing as "easy" hydroponics, requiring only a minimal investment in equipment? Yes! Hydroponic gardening can be as basic or as elaborate as you want it to be. Let's unveil the mysteries of hydroponics to see a technique that works perfectly for any first-time grower! Hydroponic growing methods are techniques for raising plants without the use of conventional soil. Nutrients are supplied to plant roots through a nutrient solution. Hydroponic nutrient solutions contain all needed minerals or nutrients, both macro (NPK) and micro nutrients as well as trace minerals. GROWING MEDIUM: Although plants might be rooted into a growing medium, in hydroponics the medium is inert, resistant to degradation. Examples of rooting substrates include rockwool, perlite, Growstones, gravel and clay pebbles. Plant roots can also grow right in the solution with only a very small amount of rooting material. AEROPONICS: This technique is a specialized form of hydroponics in which plant roots grow in the air, suspended in an enclosed environment. The root zone is kept at a very high humidity. And roots are sprayed periodically with a mist of nutrient solution. AQUAPONICS: A hybrid system of both hydroponics and aquaculture. In aquaponics, plants are grown in the same solution that is used to raise aquatic animals such as fish. The major input in the system is food for the animals. The waste from the animals enters the water and is then drawn up to nourish the plants. In turn, the water is cleaned by the plants, allowing the animals to enjoy fresh water. Some hydroponic systems are powered with pumps. They may circulate the solution between multiple plants and a common reservoir. Other techniques are non-circulating, keeping the solution within a single reservoir. Sometimes aeration stones are used to add oxygen to the nutrient solution. A hydroponic system might be non-circulating, with or without the aid of added aeration. Circulating hydroponic systems allow for the growth of large plants, even fruiting vegetables. They can provide a consistent supply of nutrients along with plenty of oxygen for healthy root growth. And such setups are equipped for outdoor operations where temperatures may start to climb. But there is a little more work in setting them up. There is a slight operational cost for any electrical pumps, and certainly the upfront investment is greater too. Surprisingly to some people, you really don't need pumps or aeration stones for a simple hydroponics system. Just a basic watertight container can work, allowing plants to still get oxygen in their root zone. Such passive setups are great for indoor applications. They work especially well for vegetative growth such as lettuce crops. As an entry-level option, you can't get any easier! This video shows a fun entry-level project for growing a single hydroponic lettuce plant indoors! The Kratky method is named after B.A. Kratky, a researcher from the University of Hawaii. His technique is a passive type of hydroponics. It eliminates the need for pumps or any circulating system. Kratky's materials reference a raft system (where the plant floats directly on a nutrient solution). But I prefer his suspended pot technique. There's an air gap separating the lid or planting surface from the nutrient solution. This gap of humid air allows for the exchange of gases and the proper aeration of plant roots. Plants need oxygen to carry out respiration. The air gap supports healthy growth without requiring you to actively aerate the solution itself. As the solution is depleted, the level drops and the upper plant roots become air roots. They exhibit a fine, hairy texture and are specially adapted for oxygen absorption. A huge advantage of Kratky's method is that it can be easily scaled and duplicated. You can use one large tray of solution for a large batch of plants that are all planted and harvested at the same time. Or you can have an individual container for each and every plant, starting and harvesting them on a staggered timetable. There is no huge investment in infrastructure, either way. And once the plants are set up, they can grow with literally zero user interaction! A key limitation with this type of hydroponics is that you should not top off the reservoir once it is mostly emptied out. Re-submerging a large portion of upper air-roots may drown them, injuring the plant. You can maintain a certain water level or allow it to go lower. But it should not be raised. 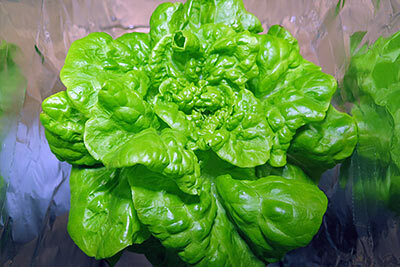 A CONTROLLED ENVIRONMENT: I think that hydroponic grown lettuce is just the perfect lettuce. When grown indoors, mine is clean, crisp and free of pests. Whether it's a greenhouse, a vertical farm or a small space in your closet at home, hydroponic plants look beautiful and work well in sterile environments. LESS FAULT TOLERANCE: Soil-grown plants tend to withstand greater variations in pH, nutrient concentration, light intensity and humidity. They may also be less prone to damage from pathogens. Soil has excellent buffering capacity and hydroponics just don't work the same way. So to do it right, you need to keep things clean and to measure things accurately. A pH and TDS meter are essential to success!